The idea for this Asian Sautéed Radish Salad with Farro really just evolved over the period of about a week. 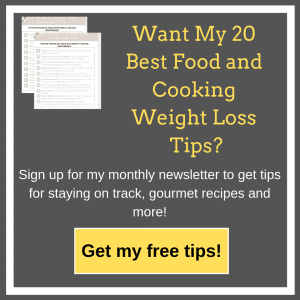 I had heard about roasted radishes on Connect (Weight Watcher’s Social Group) and how they taste very different when roasted. So I decided to try them and they were delicious!I As I was eating them, I thought, “This would be good as a salad with farro.” From there the salad took on a life of it’s own. I tried roasting the different vegetables together in the oven. They were pretty good, but I decided they might be even better sautéed in a cast iron skillet. I was definitely right on this one! 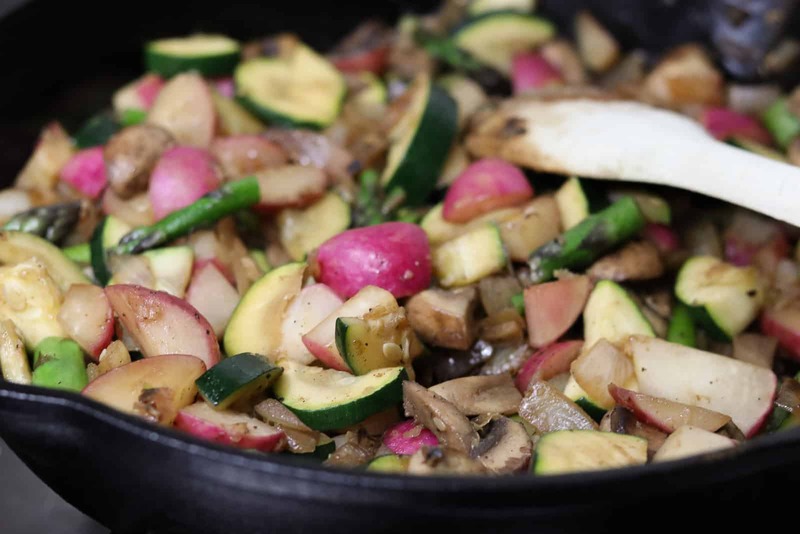 The cast iron skillet holds the heat and allows you to cook the radishes and vegetables without much oil and gives the onions a nice caramelization which you don’t get in a non-stick skillet. You can control the degree of crunchiness in the vegetables as well when you use a cast iron skillet. If the idea of using a cast iron skillet scares you to death, don’t worry, people do not realize how super easy it is to use and clean a cast iron skillet. You can even buy pre-seasoned pans (one of mine I found at Costco (be sure and follow directions for first use), the other one belonged to my husband’s grandmother. Both of them work well. There are a million different opinions on how to best to take care of them, but really all I do is rinse the cast iron skillet out with hot water. Then I swipe my chainmail scrubber around to get off the cooked on bits (takes them right off). I rinse the cast iron again with hot water and put it back on stove. Then heat pan until all water has dried, a few minutes. Then I add a small amount of vegetable oil and carefully wipe it around the pan (it’s still hot). That’s it. Super easy. Once you start using a cast iron skillet you will love it! And the more you use it, the more it becomes non-stick. Because a cast iron is non-stick, it’s great for healthy cooking. 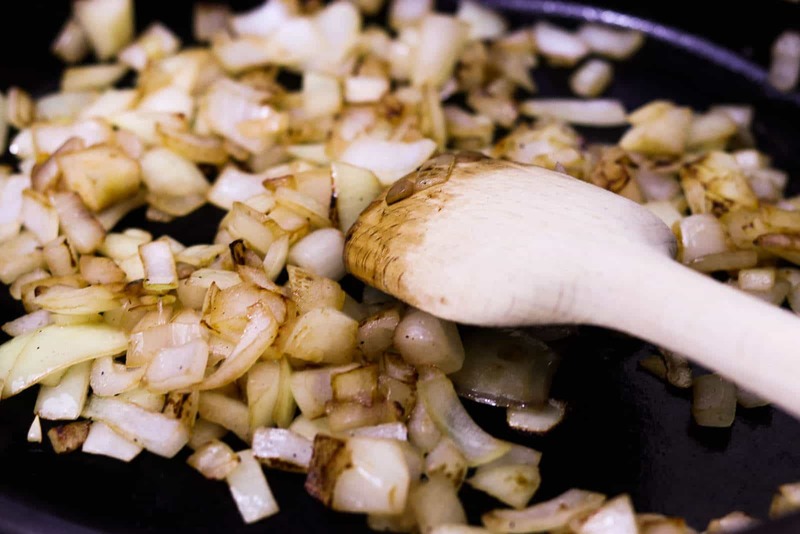 You only need a small amount of oil when sautéeing the vegetables and caramelizing the onions. You can cook the vegetables in no time! They are good on their own but I like to serve them with farro and my Asian dressing. 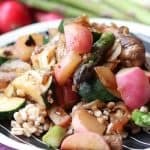 I love this Asian Sautéed Radish Salad with Farro! 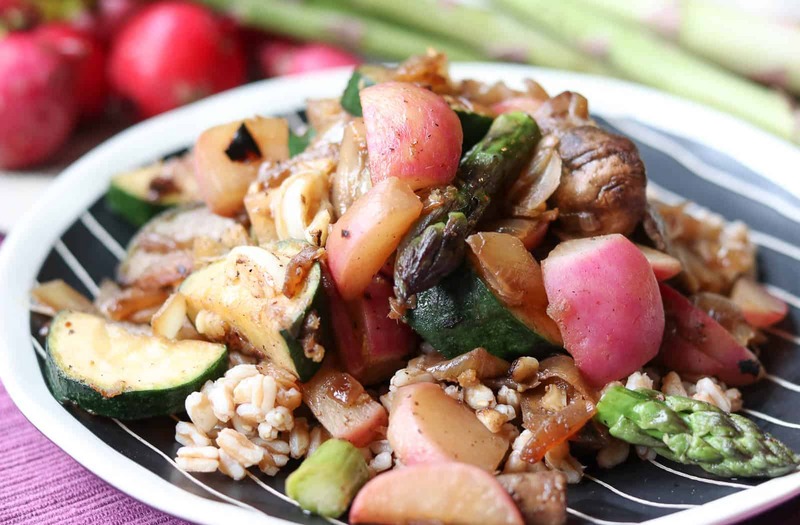 The sautéed radishes and vegetables are good on their own, but I really like them with the farro and Asian dressing. It’s almost like a stir fry or hot salad and very filling. Chinese 5 Spice adds a bit of warmth (not spicy) and comfort to the dish. To make the dressing, combine all ingredients well. I like to use an immersion blender but you can just stir it thoroughly if you don’t have one. Next, preheat a cast iron pan on medium heat while you chop the onions. When finished chopping onions, add 1/2 T. sesame oil to the pan. Add the onions. Next, chop the radishes, mushrooms and zucchini. Keep stirring the onions occasionally while chopping the other vegetables. You want the onions nice and brown. When they start to really brown, turn down the heat to low while you finish chopping the vegetables or turn to off if you are a slow chopper or they are browning too fast. Add the radishes, zucchini, and mushrooms to the onion mixture. Add remaining sesame oil (1/2 T.). Mix well. Turn the heat up to medium high. Rinse the asparagus and place in a microwave safe bowl. Be sure there are a few droplets of water in the bowl from rinsing, if not add just a teaspoon of water. Cover (I just use a plate to cover the bowl). Microwave the asparagus for about 20 seconds. The asparagus needs a little more time to cook than the rest of the vegetables, thus the reason I pre-cook it a bit in the microwave. Add asparagus to mixture. Continue to cook until desired doneness. I like the radishes almost tender when pierced with a fork but I don’t like mushy zucchini so I cook until the zucchini is done. Add garlic, ginger, salt and Chinese 5 Spice. Cook for just a minute, then remove from pan and place in a serving bowl. When ready to eat, dish out 1/2 c. farro on each plate or bowl. Add about 1 c. of vegetables. Spoon 1 T. of the dressing over the vegetables. Enjoy! No Replies to "Asian Sautéed Radish Salad with Farro"